Windows 8, Larousse and “proud to be a developer” ! The Windows 8 consumer preview is out ! You can find a lot of information and download links on this page : http://preview.windows.com. I am not used to speak about the apps I work on but this time I have too! It’s several weeks now that I work on the ‘Larousse illustré’ version for Windows 8. You can now find it on the windows store (french version only). It was a really nice experience with great people involved and I am lucky that my company (Infinite Square) let me be a part of such a great project ! The Techdays 2012 are coming ! The 2012 Techdays are coming, 7 more days and it’s here ! This year I am proud to be speaker on two sessions and I hope to see you there ! In the past, I played a lot with 3D inside WPF. A few days ago, I discovered something awesome : using the power of the Cloud to create beautiful 3D scene. (This is also a part of a contest and you can help me win by liking this two pictures : one and two. Windows 8 tips: fast access to an app. Today I was talking with my friend Etienne Margraff – also know as Emmanuel – (blog and twitter)and I told him how boring and time-consuming it was to press Win+F to access the search screen on my windows 8 application. Two fingers are too much for me ! 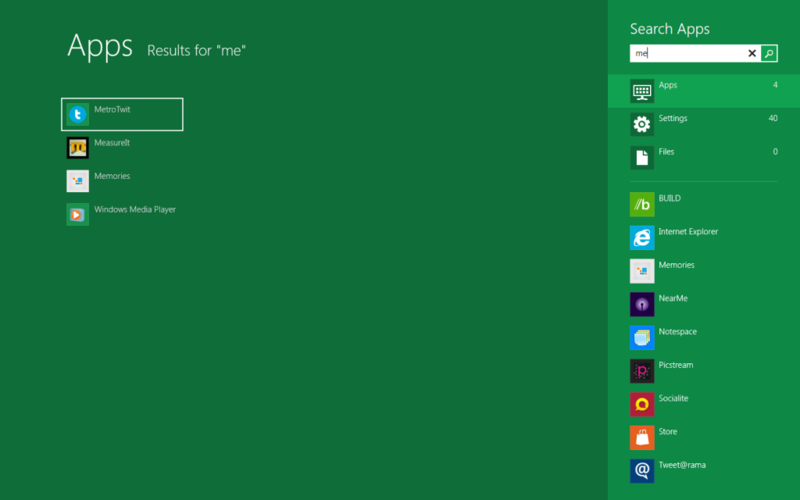 The search screen in Windows 8 ! This is in fact the behavior of Windows 7 start menu but I forgot it :-s ! Maybe because of all this flashy metro tiles !